They say there is strength in numbers. 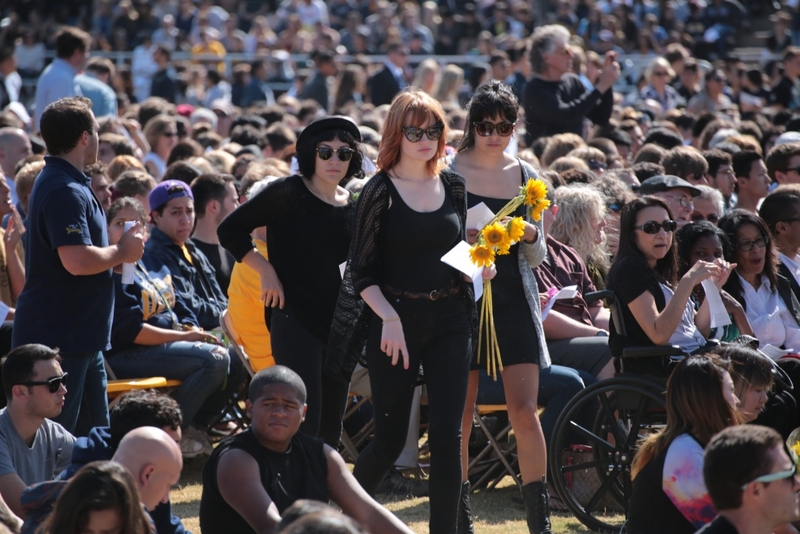 Never was that more evident than at UC Santa Barbara on Tuesday, when some 20,000 people convened in solidarity and support at a campus memorial service to honor the six UCSB students killed in the May 23 tragedy in Isla Vista. 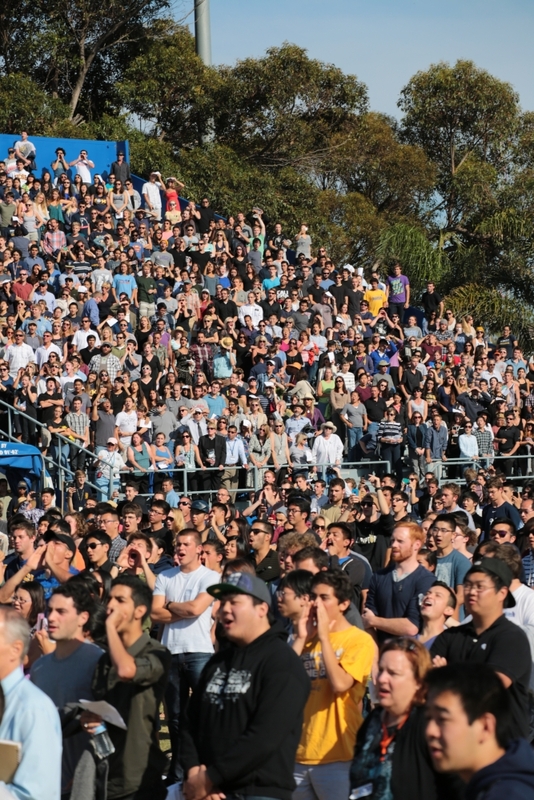 Packing the bleachers and blanketing the sun-soaked field at Harder Stadium, they came to pay tribute to George Chen, Katherine Cooper, James Hong, Christopher Ross Michaels-Martinez, David Wang and Veronika Weiss. 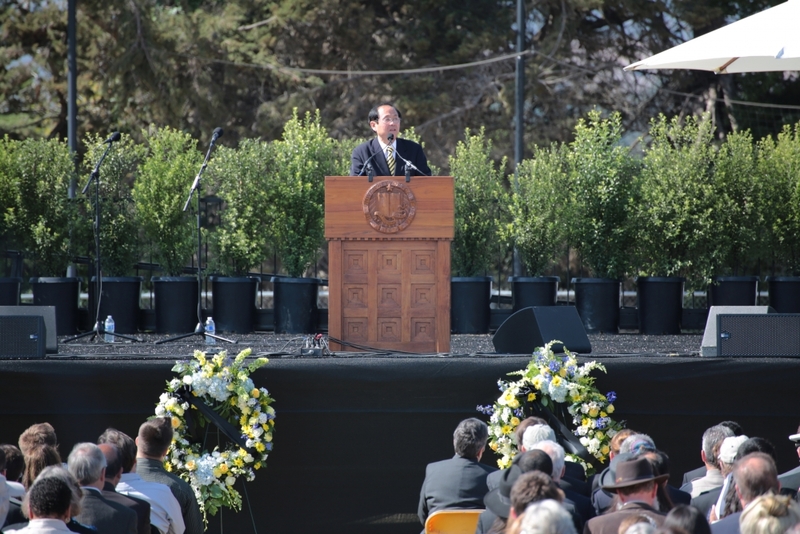 “We come together this afternoon with heavy hearts — our UC Santa Barbara family is in mourning,” said Chancellor Henry T. Yang. “We grieve the loss of these precious lives … we remember the joy and the light that they brought to this world. An aspiring engineer who loved to play basketball with his father. A young man committed to his studies, but never too busy for his volunteer work at a local YMCA. A lover of art history known for her vivacious personality and inclusiveness. A team captain beloved for dedication and kindness. A Taipei native who came to California to pursue computer engineering. A sophomore who spoke with his father only an hour before he died, relating his experience that day in a campus cleanup effort. Such were the snapshots of the six students — glimpses into the remarkable people that they were — offered by University of California President Janet Napolitano. 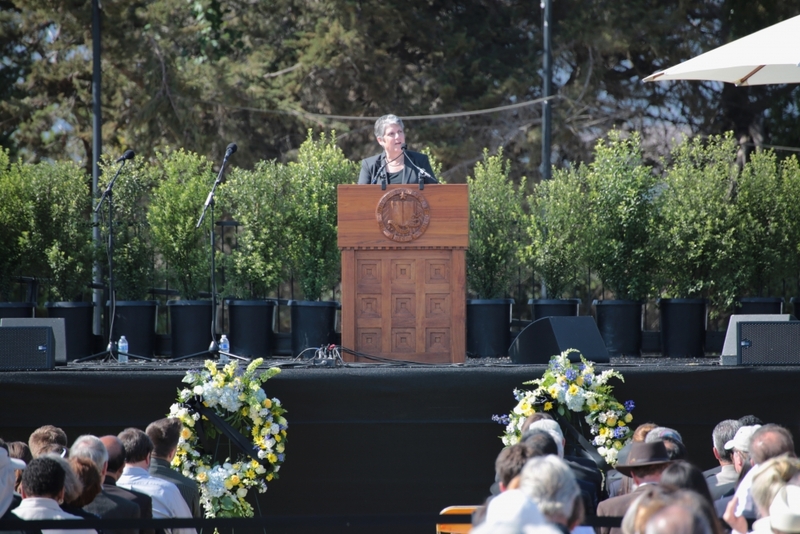 “It is important that we not lose sight of the lives we have gathered to remember … that we not let the arithmetic of this atrocity define them,” Napolitano said. “These were individuals who each left a mark on the world around them … the good they did, their personal triumphs and their personality traits, the grace notes they brought to their everyday lives, their character, even their quirks. They say there is peace in unity. That solidarity begets serenity. Students and faculty, staff and community members, campus supporters from near and far. 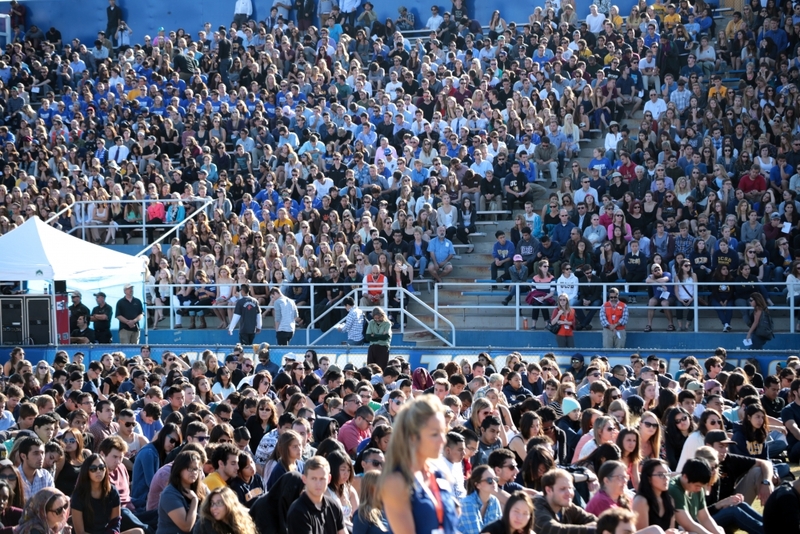 They all came — many in UCSB gear, nearly all bearing black ribbons on their clothing — sitting shoulder to shoulder to hear, and cheer, messages of resilience and hope. 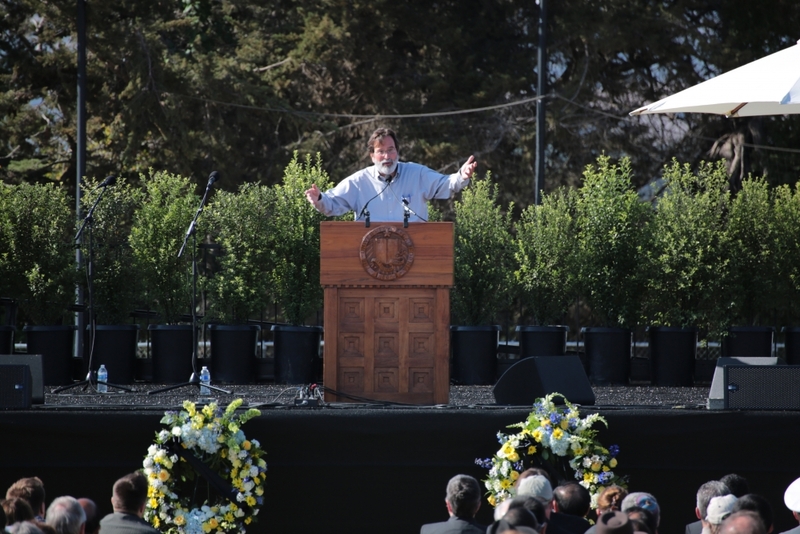 “As we come together to seek solace and share that which connects us to one another, there is one thing I know for sure — that we have a spirit and a resilience within our community that can never be taken from us,” newly elected Associated Students President Ali Guthy told the crowd, before re-stating the names of the victims. “We remember them. They say that time heals all wounds. They don’t say when. To his parents’ surprise, Christopher Michaels-Martinez decided at age 8 that he wanted to play football, his father recalled on Tuesday. Relating the story of his son getting knocked into the air and onto his back by a much larger teammate during a practice session, Richard Martinez remembered thinking “My god he must be hurt. Martinez also made an impassioned plea to the crowd to take political action against gun violence, inspiring a rousing, stadium-wide chant of “Not one more,” a slogan he coined spontaneously during a weekend press conference. After his interplay with the audience, Martinez returned to the memory of his only son’s football practice.